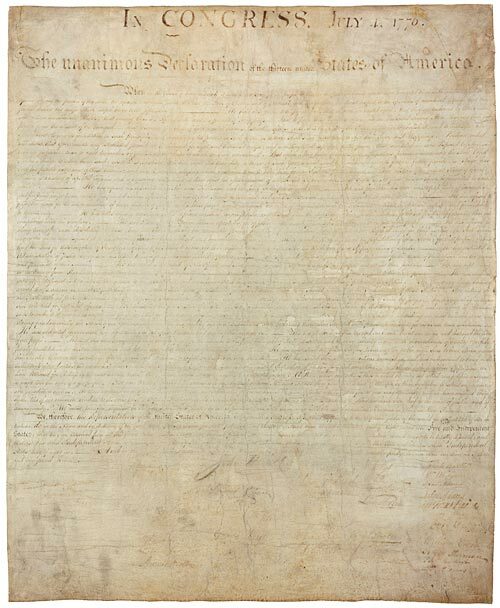 The Declaration of Independence on July 4, 1776, is one of the most important documents in the history of the United States. It marked an official step taken by the American colonies toward independence from British rule. The original Declaration of Independence is on display in Washington, DC. The 56 signers of the Declaration of Independence included future Presidents, Vice Presidents, and Members of the United States Congress. John Hancock, President of the Second Continental Congress and a Governor of Massachusetts, was the first to sign; he used such a large, bold script that people now speak of a ‘John Hancock’ to mean a signature. The Declaration of Independence, along with the Constitution and the Bill of Rights, is on public display at the Rotunda of the National Archives in Washington, DC. Source: Declaration of Independence: Official signed copy of the Declaration of Independence, August 2, 1776; Miscellaneous Papers of the Continental Congress, 1774-1789; Records of the Continental and Confederation Congresses and the Constitutional Convention, 1774-1789, Record Group 360; National Archives. Recommended Reading: The Declaration of Independence: The Story Behind America's Founding Document and the Men Who Created It (Hardcover). Description: The fifty-six signers of the Declaration of Independence, the foundation of America's freedom, created a nation and launched a freedom movement the world had never seen. Today it seems inevitable that the thirteen colonies would declare their independence from Britain. And yet in 1776 it was not so. Here is the extraordinary story of drama and daring, sacrifice and selflessness, danger and potential death. Continued below.